If the nerve of your tooth becomes infected by decay, or damaged by trauma, root canal treatment is often the only way to save your tooth. Inside your tooth’s hard outer shell of enamel is a nourishing pulp of blood vessels, lymph vessels and nerves. The root canals, which contain the pulp, extend to the bone. Deep tooth decay, or an injury, can cause serious damage and infection to the pulp’s nerves and vessels. A “root canal” (the technical term is endodontic treatment) cleans out the infected pulp chamber and repairs the damage. If you remove the nerve, won’t the tooth be dead? No, the nerve is only part of the tooth’s vitality. Strong living fibers attach the tooth to the bone, which makes a nerveless tooth very much alive and functional. Am I justified in spending money for root canal treatment? The alternative is extraction and replacement of the tooth with a bridge or an implant. Besides losing and important member of the dentition, the artificial substitutes usually cost more than root canal treatment and the permanent restoration of the tooth. How long will the tooth last after root canal treatment? Often as long as the other teeth in the mouth, provided the person is in good health and his or her body has the ability to repair damaged bone. The tooth must also have healthy fibers supporting the tooth in the bone (healthy gums around that tooth). Will the tooth darken after treatment? Most of the time discoloration of the tooth does not occur. Where a tooth may have been discolored before endodontic treatment began, it is sometimes possible to correct the discoloration through endodontic bleaching procedures. Will the tooth crack or fracture? Measures will be taken while root canal treatment is in progress to prevent this from occurring. You may further prevent fracture by strengthening this tooth with a crown. Will my health be jeopardized by a root canal treated tooth? Not at all! Once an endodontically (root canal) treated tooth has healed, it takes its place as a functional organ of the body much as a once broken leg can soon support body weight. Can a root canal treated tooth be used as an anchor for a bridge? Yes indeed. With proper bone support a nerveless tooth is an excellent bridge anchor. If the tooth is dead why does it hurt so much? Discomfort prior to treatment is a result of infection and inflammation of the nerve, surrounding bone and soft tissue. 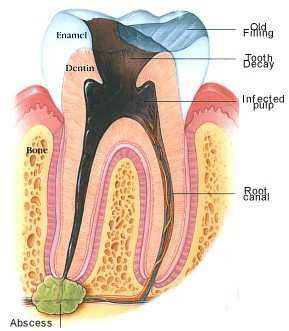 Once the offending nerve canal is cleansed and medicated, the pain will go away and the tooth will feel normal again. Can root canal infection always be treated successfully? Unfortunately not. Sharp curves due to unusual root growth and extremely narrow canals occasionally make instrumentation and medication impossible; however, this does not mean the tooth necessarily must be lost, since other procedures can often save the tooth (e.g. apicoectomy, etc.). Are you having pain? The following symptoms either indicate you may or may not require root canal therapy. Teeth should not be sensitive to a point that it alters your behavior in some manner. If you notice any pain that is new, and this pain seems to be getting worse, call to check things out — you may have a problem. Any severe toothache even lasting a day or so that then goes away may signify that the nerve of your tooth has become infected or for that matter has died. A root canal may be required at a later date — sometimes even years after that episode. It is important to note that early diagnosis and early treatment may not prevent a root canal, but it may ensure a higher success rate once root canal treatment is performed and may also avoid you from having an emergency root canal procedure performed in an inopportune and totally unexpected or unwanted time. You have moderate to severe lingering “toothache” pain when drinking hot liquids or eating hot foods. This pain may also be caused with cold liquids or foods. You have pain when chewing or biting on a tooth that may also be sensitive to touch, tapping, or pressure and may be associated with slight swelling. Your toothache pain wakes you up at night and you most likely feel the need to take some form of pain medication to relieve your suffering. You have a bubble on your gum that looks like a pimple and when pressed in the region may release blood or pus. You have pain that starts at one tooth and then radiates or is referred to other regions of your upper or lower jaw, or head. A common example is a lower molar (back tooth) causing pain that refers to your ear on the same side so as to simulate an earache. You have pain when you chew and/or drink hot or cold liquids. The pain is mild in nature and not prolonged. Many times this pain is felt after a recent dental procedure such as a filling or a crown.Â A rule of thumb is that if the pain does not subside within a 6 week period of time or becomes increasingly severe, then a root canal will be required (make sure the bite is correct!). You have pain when you drink cold liquids, but the pain goes away immediately or within a few seconds. This is a normal response and may exist throughout your life. You have pain when you eat sweets, but the pain doesn’t last very long. You probably have a cavity, loose/broken filling or areas of the root surface that are exposed (receded gums). Root canal therapy in this case would only be indicated if the decay is deep and touches the nerve. You have swelling on the gum area around the tooth. The tooth may be sensitive to touch however there is no pain when drinking hot or cold liquids. The pain may be severe but when you brush or poke around the area the pain is relieved. This type of pain is usually indicative of a gum abscess not a root canal problem. Often we will take an x-ray of the area and perform a series of tests to see if the nerve of your tooth is responding normally or not. A normal response (no pain from the nerve) means the problem is most probably gum and not root canal in nature. You have pain in a group of teeth, non-specific in nature and usually aggravated while walking downstairs or jumping. This type of pain is usually reflective of sinusitis and root canal is not required. You have pain to touch or squeezing in the cheek areas or you have increased pain and difficulty to open your mouth. This may be bruxism, pain due to clenching or grinding your teeth. You have momentary pain to cold air. Because the pain is only momentary, it is still within normal limits — however watch that the situation does not worsen. You experience sharp pain when biting down on a tooth usually in a specific way. You may have a cracked tooth, which may or may not end up with root canal but will require a full crown restoration to prevent the fracture from increasing in size. You have electric type pain — sharp and shooting, similar to that of chewing on tin foil. This is galvanic pain. It is typically related to metal fillings in your mouth. If it becomes a consistent problem, call, since you may consider having your filling changed to a non-metal filling.